Knowing that Shri Guru has decided to go to Shri Shailya, all the disciples and citizens felt very happy. They said, "You are our treasure. Why do you go leaving us?" Shri Guru smiled and said, "You need not worry. I shall stay here secretly. I shall have bath at the Amarja Sangam in the morning. In the midday I shall come to Gangapur math and accept Nirgun Puja and give Darshan to the devotees. From the viewpoint of the public, I am going to Shri Shailya Yatra. Have no doubt. I shall always stay at Gangapur. The Ashwattha here are like Kalpataru." Saying this Shri Guru started for Shri Shailya. People accompanied him for some distance and when they returned to the math they saw Shri Guru there. After some time he disappeared. All wondered at this miracle. Shri Guru went to Patal Ganga, flowing at the base of Shri Shailya, He asked his disciples to prepare a flower-seat and said, "I have to go to Mallikarjuna on Shri Shailya on the other side of the river." The disciples prepared a nice seat of flowers of Shevanti, lotus, malati, kanher etc. on the leaf of kardali and placed it on the riverside. Shri Guru said, "Now you should return to your respective places". All were greatly aggrieved. Shri Guru sat on the flower seat on Magh Vad 1st, on Friday when Guru (Jupiter) was in Kanya (vergs) Rasa at evening time and before going away said, " I am going to the place of self-bliss. I shall send flowers as gift, which you should distribute amongst yourselves and worship them, daily. I like singing. I shall be near those, who sing prayers. They will get all the pleasures". Saying this Shri Guru disappeared in the river. After some time some boatmen came from the other side of the river. They told, "We saw Shri Guru on the other side. He was looking like a sanyasi and was holding a dand (stick) in his hand. He had golden sandals. He told his name as 'Narasimha Saraswati. He has given a message for you, 'I am going to the Kardali-Van. Still I shall be at Gangapur. Do not worry. I am sending flowers as gift, which may be distributed amongst yourselves." All were waiting for the flowers. After a little time, four flowers came flowing. They were taken one each by Sayamdev, Nandi, Narahari and myself. Here is the flower given to me. Saying this, Shri Siddha showed the flower to Namdharak. Such is the greatness of Shri Guru. I have narrated only a part of Shri Guru's life, which is very exhaustive. Those who read, hear and write this life will attain all the pleasures. These nectar-like tales will give four Purusharthas and also Paramartha." After hearing the 51 Chapters of Shri Guru-Charitra, Namdharak lost senses and got Samadhi. His body perspired, his throat got choked and tears flowed from his eyes. He could not speak out a word. Shri Siddha Muni was pleased to see this state of Namdharak. Though the disciple got Samadhi, he should be awakened for the benefit of the people. Thinking thus he moved his hand over his face and body with affection and called him and said, "Dear boy, come on senses. You have got 'dnyan' and you will get salvation. But if you remain in meditation, how will the people be benefited and enlightened? You asked me and I narrated to you these nectar-like tales of Shri Guru's life. You also heard them conscientiously. You should therefore elaborate them and propagate amongst the people." Namdharak opened his eyes and placed his head on the feet of Shri Siddha and said, "You are Shri Guru yourself. Shri Guru's life, that you have narrated, is even more sweeter than the nectar. I am not contended yet. Please tell me the whole life again in short". Hearing this just as a physician prepares the Sanjeevini pills mixing many medicines and keeps the pills with him, similarly I am telling you the summary of this life of Shri Guru. Further Shri Siddha said, "Though Shri Guru has disappeared still he gives Darshan to his sincere devotees as before". Namdharak- "Kindly tell me the procedure of week-reading and other rules to be followed during the week". Shri Siddha-"Shri Guru-Charitra can be read any time with pure mind. The credit of reading it in a week is still great. For this, one place and seat should be selected. Keep control on the senses during the week. Before starting the reading bow to God, Brahmin and elders. Worship the volume of "Shri Guru-Charitra". One should complete 7 chapters on the first day, read upto 18th chapter on the second day, upto 28th on the third day, upto 34th on the fourth day, upto 37th on the fifth day, upto 43rd on the sixth day and upto 52nd chapters on the seventh day. After reading, worship the volume and take light dinner. Some observe fast for the week; but if this is not possible have food of only one type of corn. On the eighth day, for completion of the week reading, take meals with a Brahmin couple and offer money as Dakshina. If the reading is done with devotion and pure heart, Shri Guru gives Darshan in dream and fulfills one's desires. The trouble of spirits and ghosts vanishes and one gets peace of mind. May Baba's blessings be always with all of us. Let baba be with you throughout the reading of Gurucharitra and bless you with what is best for you. We had done GURU CHARTIRA prayan in our family completing on THE GURU POORNIMA DAY by Baba's grace. A small piece of information requested: Does any brother and sister of our Sai Family know where we get HINDI VERSION of GURUCHARITRA. 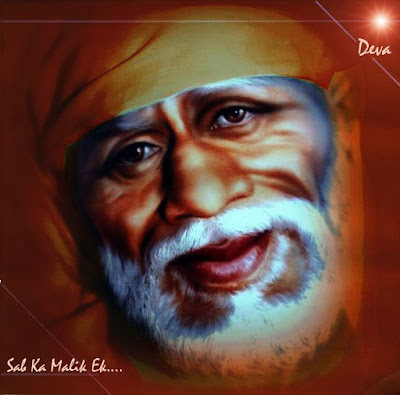 Rupali dear welcome to BABA SAI's Blessed Online Mandir. Rupali if you can post a link here everyone can read the SSC in hindi. Everyone would like to read it. Another English translation of complete Guru Charitrain Marathi is also available at shreeswami.org. The translation is by Shri Laxman Narayan Joshi & Shri K.V.R.Rao. Gurucharitra in Sanskrit (from original Marathi) was composed by Shri Vasudevananda Saraswati. The site http://www.shrivasudevanandsaraswati.com contains his other texts in Sanskrit. The term "Parayana" means reading the holy book with devotion and faith. There are two types of parayana. Some people read daily in the morning after completing their morning rituals. Depending on the time available, people read one complete chapter or particuler number of stanzas. It is believed that reading particuler chapter like 4 th, 10 th , 14 th, 18 th one is blessed with respective said fruits for example: if one is aspiring for wealth - the 18 th chapter, for afraid of death - 14 th chapter etc. The 14 th chapter is considered to be the nucleus of this grantha, because in this chapter sri Narasimha Saraswati gives assurance (Abhay Vachana) to his bhakta who is facing death sentence that He will wait for his bhakta till he comes back after facing the death sentence. After completing the regular reading this grantha is wrapped in a saffron or red color silk cloth and kept in sacred place of pooja room. The second type of parayana is reading the whole book in seven days as prescribed in the book. One can start saptah on any day preferably on saturday, so that it is completed on friday, the day swamiji took nijanand.On the first day of parayana, the place of parayana is cleaned decorated with kunkum and haldi,a nilanjana of ghee is lighted. After completing morning rituals like pooja one has to perform parayana sankalpa with the blessings of guruji. A coconut, a sankalpa fruit, the holy book and a photo of Lord Dattatreya is kept on a platform. After offering prayers, the parayana is started. It takes about 2 to 2 and half hours of daily reading. The place of parayana should be same for the seven days. There are some rules and regulations to be observed during these seven days. One should start parayana with clean mind, complete faith and full devotion. One should not accept eatables outside one's home. Only simple meal should be taken. One should observe complete brahmacharya, should sleep on floor or on a grass mat.Should not indulge in any violent activities, should not leave one's home town. The seventh day the parayana is concluded. Relatives and friends are offered the prasadam.The grantha is also called "Kalpavriksha" and "Kamadhenu", as it fulfills all aspirations. By repeatedly performing the parayana saptahas at frequent intervals throughout the year and the eve of sri Datta Jayanti one can train mind and body towards attaining moksha. Thank you dipika ji and sanjiv ji. Indebted to you for your beautiful posts.